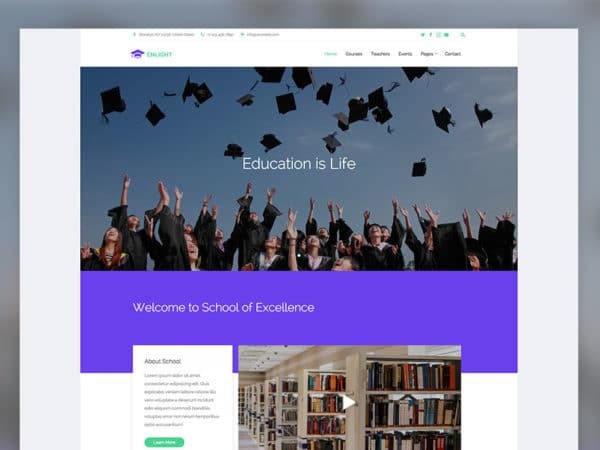 School/Education website templates made for present net-savvy generations. The Internet has given us the freedom to learn on the go. We no need spend hours within four walls to learn a new skill. We can learn new things in our spare time and can shape ourselves to be a better version of us. Taking education online let the students access the study materials when and wherever they want. Smart student-friendly elements are given our education website templates to help the user select a better course. For example, course rating and reviews of the students enrolled in a particular programme are given so that the users can pick the best course for them. Running an online course website is not an easy job, you have to do a lot of back-end work. We have taken care of all the present day standards and optimizations on the front-end and give you the peace of mind to concentrate on the backend integrations.